Juicing can help you lose weight in a very effective and nutritious way, and best of all, juicing allows you to shed some extra pounds while getting rid of toxins. While Juicing is great for cleaning the system, you also want to avoid over juicing. If you juice fast too much then your body will have a hard time adapting to eating solid foods again. Over dosing on some juices can also cause issues so you need to juice fast in moderation. However, drinking fresh herbal juices is part of a healthy diet that centers around plant-based foods. Adding herbs to your juices increases their health benefits. If you want to lose weight with juicing and want to maximize the results, adopt these herbal juices for weight loss and get in shape not instantly but with lasting effect! Prickly pear is a cactus plant better known as Indian fig; reduce weight gain and acts as a diuretic. It helps to control your blood sugar and bad cholesterol levels. Your steady blood sugar levels do not make you crave for sugary and starchy foods, you naturally tend to lose weight. The fruit is also a good source of antioxidant. Certain antioxidants too increase the rate of calorie burning and fat oxidation. The whole fruit is high in fiber content which may help you with weight loss by making you feel full and moving your bowels to reduce water retention. Diet-friendly prickly pears are a good choice for people who are monitoring their weight. To make the juice, cut off both ends of the fruit and cut a slit down its body. Peel off the skin until the underlying pulp is revealed. The flesh has many tiny edible seeds. 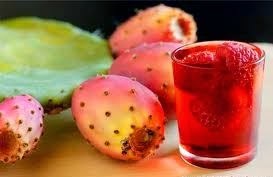 Put pulp of 4 prickly pears into your food processor or use a blender to take out its juice. Strain the liquid through a fine mesh sieve and discard the remaining seeds. Four fruits will give you about 1 cup of juice, which is low in calories, yet sweet. 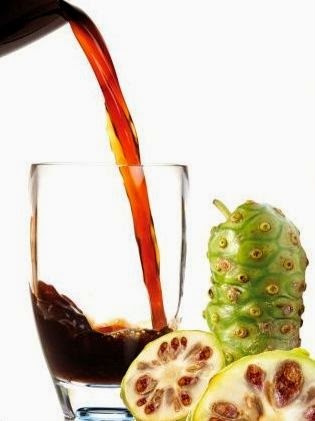 Morinda citrifolia is the scientific name of the Noni plant generally popular as Great Morinda or Indian mulberry. Noni fruit cannot be eaten as raw but can be used in the form of liquid juice. Noni juice benefits for weight loss, treating obesity as it is known to have properties that promote weight reduction. Noni juice is known as antioxidant and a boosting element. The active antioxidants present in this juice help to improve metabolism in the body. Noni juice produces nitric acid in the body which in turn uses the fat cells to draw in energy for the body. Triglycerides that are stored in fat cells helps to reduce or remove them, resulting in weight loss. Hence, it helps reduce the fat content in the body. Various diets and exercises also help you to reduce weight but the weight loss due to noni has no side effects on health and also, the increase in weight after eliminating the consumption of noni is minimal. Not much research has been done as to how it leads to weight loss but those taking noni can swear by its health benefits. Noni juice is extracted from Noni fruit (resemble to pineapple) that grows on Noni tree. Noni juice should be prepared by putting a bunch of ripe noni fruit into a container and covering it. That’s it. It needs to sit and the juice will start dripping from the fruit. Noni juice is recommended to take in small amount initially. Starting from 1ounce one can exceed amount up to 3 ounce. It must be taken1-oz. serving in the morning on an empty stomach at least 20 minutes before having food and another 1-oz. serving in the evening. Wheatgrass juice is rich in many nutrients such as iron, magnesium, calcium, amino acids, vitamins C, A and E, B12, B6 and chlorophyll. For weight loss, wheatgrass is very low in calories and has no fat and keeps one from feeling hungry or having cravings. Cravings are a huge part of obesity. Addicting foods with empty calories promote weight gain. Wheatgrass can keep one satisfied throughout the day, calming craving possibilities. Wheatgrass juice is a powerful source of potassium, which aids in increasing muscle tone helping to burn calories. Wheatgrass can provide the endurance and energy needed to burn of calories without getting fatigued. The nutrients in wheatgrass speeds up metabolism and this converts calories to energy. You can burn more calories and this helps with weight loss. Wheat grass juice also helps with weight loss by getting the thyroid gland moving. Hypothyroidism slows down metabolism causing weight gain. Wheatgrass juice boosts metabolism and prevents obesity and indigestion. 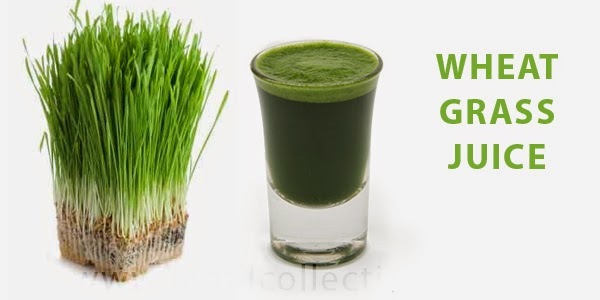 Wheatgrass juice is very potent A daily drink of 1oz (about 30ml) of wheatgrass is recommended to start with, increasing to 2oz (60ml) after a couple of weeks as long as it makes you feel good. It's a good idea to drink it on an empty stomach. A shot glass holds 2oz of juice. 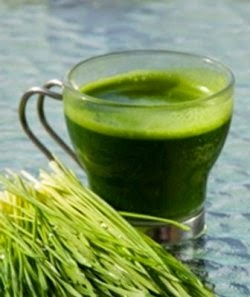 3 bunch of Wheatgrass - enough to make 2oz (60ml) of wheatgrass juice. Squeeze lemon juice and add Honey. Banana fruit grows in hanging clusters and these clusters are known as Banana Stem or a Bunch. Ensure that the banana stem is firm and fresh. It usually ranges from pale pinkish white to off white colour and is around 8 to 10 inches in size when sold in the market. It is a good source of dietary fiber. Since it is high in fiber, it acts as a laxative and can ease constipation. Fresh juice of the pith of the stem of plantain, taken regularly on an empty stomach can help in weight loss. The juice has various other benefits. It is a relief for ulcers, burning sensation and acidity. Its astringent quality helps in blood coagulation. 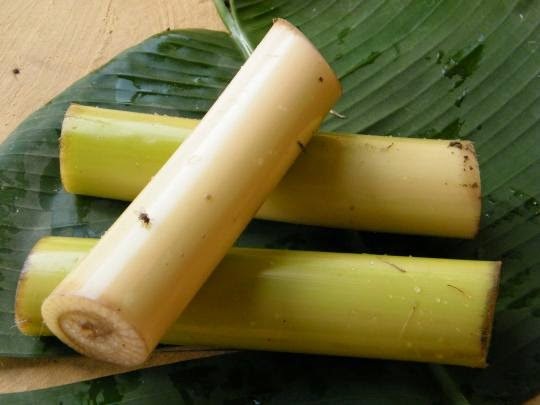 Banana stem is rich in potassium and thus if regularly taken, it can cure stomach pains. Put chopped plantain stem in juicer & extract the juice. Add water honey & lemon juice Stir well & drink. You can also adjust honey & lemon juice to taste because it will be a little astringent and bitter in taste. The Acai (pronounced ah-sah-ee) berries are dark purple and about the size of a blueberry. 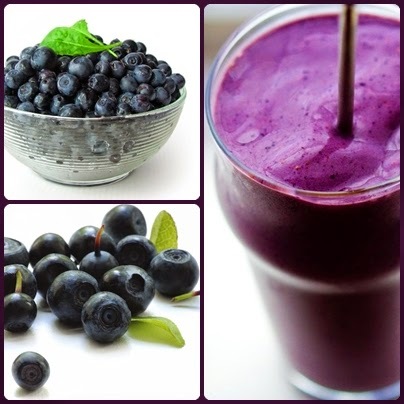 Like blueberries, they are potent antioxidants and are an excellent drink for weight loss. It's one of the few fruits, besides avocados, that contain so small amount of monounsaturated fats (MUFAS). The berry’s natural concoction of essential fatty acids, fiber, photosterols and amino acids work together to help your body burn fat more efficiently, process food more quickly and shed the unwanted pounds that you’d like to lose. Acai berry juice will fill you up and suppress your appetite for other more fattening foods. Drinking acai berry juice will also boost your energy. With more energy you will exercise more which will benefit your weight loss efforts. Measure 2 tablespoons (30 milliliters) of acai juice into a small glass. Consume 1 ounce of acai juice once a day for three to four days. If you do not notice any negative side effects, increase the amount to 6 tablespoons (90 milliliters) each serving, limiting yourself to one or two servings per day. Acai juice tastes especially great with other berry juices. Mix 2 tsp to 6 tbs (10-90 milliliters) of acai juice into an 8-ounce (250-milliliter) glass of mixed berry juice, blackberry juice, or blueberry juice. Acai also tastes good when mixed into pomegranate juice or mango juice. Obesity has become a great menace today and is causing a lot of problems. Grass juice reduces your belly protecting you from obesity. Regular consumption of Bermuda grass juice helps to reduce obesity without any side effect. Bermuda grass is an indigenous plant of Asia and is superior to wheat grass. It contains crude protein, fiber, calcium, phosphorus and potash. Take handful of raw Bermuda grass (approximately 100 gram). Cut off the roots. Wash it and cut it into small pieces. Grind the grass in mixer by adding little water. Add water to the juice in the proportion of 3 parts of water to one part of the extract. Coconut water or tender coconut water can also be mixed. Do not mix any other thing. Take one glass of this juice daily in the morning on an empty stomach. It is necessary that one should not eat or drink anything for at least 1 hour after having the juice. Aloe Vera is a wonder herb with many health benefits. It is a fine natural antioxidant. 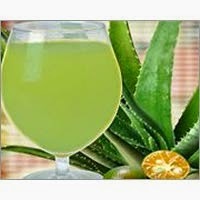 Drinking Aloe Vera juice for weight loss is an effective option. Regular consumption of Aloe Vera juice increases your metabolism thus helping you in reducing body fat. It also detoxifies your system thus cleansing your digestive system and further reducing weight. Not only Aloe Vera is good for weight loss, it also has side effects. It is advised to consult a doctor before consuming Aloe Vera juice. To make this juice, remove the upper skin of the leaves, grind it and take out the juice. The juice can be filtered and stored in refrigerator. You may add honey and lemon to get the bitterness out. The course of consuming Aloe Vera juice for weight loss should be followed for a week or two. If you are taking diabetes medicines, consult your doctor first before having herbal juices. Pregnant and lactating mothers should also talk to their doctor. If you experience exhaustion, nausea, dizziness or dehydration, speak with your doctor. Today, people are very concerned with their weight. Most people watch their kilograms very closely for any additions. Weight loss can be achieved by adopting natural methods and some herbs do help in reducing weight by controlling the chemical reactions within the body. Read this article to find herbs for weight loss. 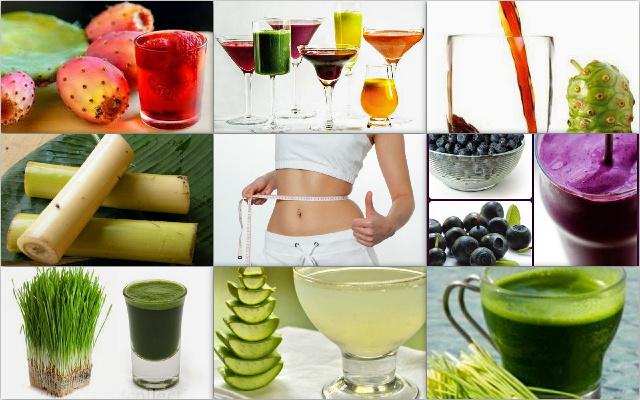 Want to lose weight start with some natural and healthy vegetables and fruits juices. The key to weight loss is to restrict calories but it is very difficult to get all the nutrients while reducing calories and restricting food intake. Combination of these vegetables and fruit juices will help you to achieve your weight loss target in healthy way.